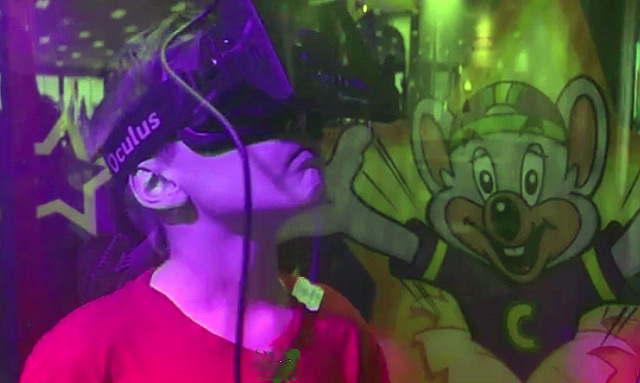 Dallas, TX, USA (May 20, 2014) / PRNewswire / — Chuck E. Cheese’s, the family entertainment leader and number one kid-friendly restaurant, is adding the hottest ticket in gaming to its birthday party packages using the groundbreaking technology Oculus Rift in the Ticket Blaster. “Chuck E. Cheese’s Virtual Ticket Blaster Experience” will make its way to select markets beginning today in Dallas and on to San Diego and Orlando later this month. Birthday parties booked during the six–week test in the three markets will offer the Birthday Star a turn in the virtual Ticket Blaster. The headset uses 360–degree head-tracking technology and features a 3D view so users feel as though they are inside the Ticket Blaster with Chuck E. During the experience, the headset will register the number of tickets collected, which will be fully redeemable at the merchandise counter. The first store equipped with “Chuck E. Cheese’s Virtual Ticket Blaster Experience” will be at 13364 Montfort Drive in Dallas. Later this month will be 15 more locations in the Dallas–Fort Worth area, six in Orlando, Fla., and eight in San Diego, Calif.
Chuck E. Cheese’s originally began working with Dallas–based Reel FX in 2012 on the reimagination of Chuck E. Cheese. Reel FX is a pioneer at the forefront of Oculus Rift virtual reality content, so they were a natural choice to bring Chuck E. into a virtual reality experience and game. Reel FX was an early adopter and supporter of Oculus Rift, dating back to the technology company’s initial development and fundraising push through its Kickstarter campaign in 2012. Facebook acquired Oculus VR in March 2014 for $2 billion.